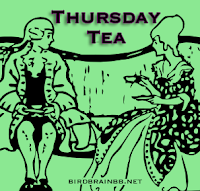 Thursday Tea is hosted by Anastasia at Birdbrain(ed) Book Blog. Here's how it works: Tell us what tea you are drinking (and if you like it). And then tell us what book are you reading (and if you like it). Finally, tell us if they go together. This week I'm drinking Stash Tea's Orange Spice: It is a "blend [of] full bodied black teas from India, Sri Lanka and China, with the finest cinnamon from Sri Lanka and sweet California orange peel and orange oil. The result is a very aromatic tea that has the flavor of zesty orange and spicy cinnamon." This is one of my favorite teas, and I've been drinking it iced and unsweetened. I am almost done with The Girl with the Dragon Tattoo, and it is getting hard to turn off my MP3 player! The new issue of AudioFile magazine came the other day, and that got me dreaming of new audios. Here are the covers of just a few of the new releases that caught my attention. I've read at least one book by each of these authors, and I'm looking forward to more. I've already pre-ordered Catching Fire in print, but some of the others I may read with my ears instead of my eyes. Orange spice iced tea is the way to go when sitting on the deck on an August evening, flipping through the magazine, and circling the books I want to read. What new releases are you looking forward to reading in the next few months? I am drinking a very unsatisfactory cup of Earl Gray tea (brand unknown) from a convenience store (that should have been a clue) and just posting my review of The Girl Who Played With Fire. Drinking iced tea on the deck whle book shopping sounds like a wonderful activity for a summer day. I have been drinking Boston's Mint Tea (iced) with some fresh mint from our herb garden! So funny about your wish list. I have four of them on mine too! Okay, I'm drinking Sumatra Coffee LOL, but I wanted to comment on your books Beth. I just got The Old Cape Magic from the library and I'm also looking forward to Fearful Symmetry. LOL! Both tea and books sound good. My favorite is Lipton Speacialty Ginger Mint tea-yummy. I can't wait for Her Fearful Symmetry and That Old Cape Magic-both favorite authors. Enjoy your day. I'm still drinking coffee, but plan on making tea this afternoon as I sit down to read Pride & Prejudice. I'll have to consider what Elizabeth would like. My audio of Dragon Tattoo should be arriving any day! Love that list you have there, BTW. Do you know if Catching Fire will release the audio at the same time as the book? It is going to have to be audio for us, as the kids want to listen. I hope they don't delay. I just had a glass of cranberry juice! I don't drink much tea, but Orange Spice tea sure does sound good. All of those books look good - Carl's read Catching Fire and he highly recommends it. I just bought That Old Cape Magic this morning...and the tea sounds wonderful!! Your first three are on my wishlist too! I'm not drinking any tea, it's too late at night, so I'm just sticking with the water. =) I haven't read The Girl with the Dragon Tattoo yet, but my library has it, just a matter of time! No tea for me, save when I'm out for sushi. But I really like your wish list!! Those first two are on my list, along with Year of the Flood. The tea sounds good! I need some icy drinks as it's been so hot over here! The first two books are already onto my wishlist, and I need to read The Girl with the Dragon Tattoo soon!! I LOVE just about ANY type of TEA! And I LOVE FOUR of your choices!! Thanks for having me on your blog! It's SO cute!! I plan to read The Girl with the Dragon Tattoo soon. I've bought it with me on my holiday, so I'll get round to it as soon as I've finished the Bookers. I'm so pleased to hear that you are enjoying it. Since I've already read Catching Fire I'm falling short on a list of upcoming releases I want to read that badly. I have quite a list of books to get (mainly in the YA genre which I seem to have planted myself in the middle of at this time). I am intrigued by Her Fearful Symmetry. Booklady (from booklady's blog) is so excited by it she's got my interest piqued so I'm looking forward to that. If I ever get off this computer I will start reading Brad Thor's The Apostle. Ellen Crosby's wine country mystery The Riesling Retribution will be next on my list. Drank lots of warm tea last week while visiting my mom in Alaska, as it was cool and rainy there. Looking forward to Catching Fire too. Just got The Girl Who Played With Fire today. Oh man, I can't wait for Catching Fire! I also need to get Cape Magic but it's a little bit further down my list. I really want Her Fearful Symmetry too. I love the cover so much! Catching Fire is at the top of my list, but I'm looking forward to Margaret Atwood's new book. I really like Stash's Ginger Peach Green Tea and I've been meaning to try it cold. Should make that tonight, seeing as how we're facing another heat wave.